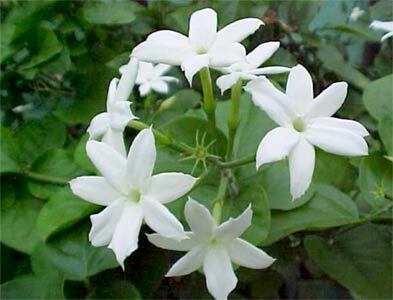 Jasmine flowers have been used to flavor tea for centuries. It is most common to consume jasmine flavored tea with meals or right after meals, as the flowers are considered a digestive aid. It is also believed that they help clear out turbidity in the blood from consuming overly rich and fatty foods. It is also taken after strong tasting foods, to cleanse the palate and freshen the breath. Some people simply like the taste, and consume this tea at any time. The characteristic floral fragrance is due to a group of dozens of essential oils, the main components contributing to the fragrance are: linalool (floral), methyl anthranilate (grape-like), 4-hexanolide (sweet), 4-nonanolide (sweet), (E)-2-hexenyl hexanoate (green), and 4-hydroxy-2,5-dimethyl-3(2H)-furanone (sweet). Tibetan jasmine grows at high altitude and has a particularly rich fragrance and flavor, with plenty of linalool (this compound has been studied for its anti-inflammatory activity). Jasmine is most commonly used in that region (Tibet, Bhutan, Nepal) for making incense, being combined with other aromatic ingredients.